Turkey production peaked at about 6.2 million pounds in 2008, but has since remained stable. Going all the way back to the 1970s, the number of turkeys produced in the U.S. soared more like an eagle than a gobbler. From 1975 to 1997, the total weight of raw turkey production increased every year except two, and more than tripled in pounds produced. It continued increasing, albeit slower, until it peaked at about 6.2 billion pounds in 2008. 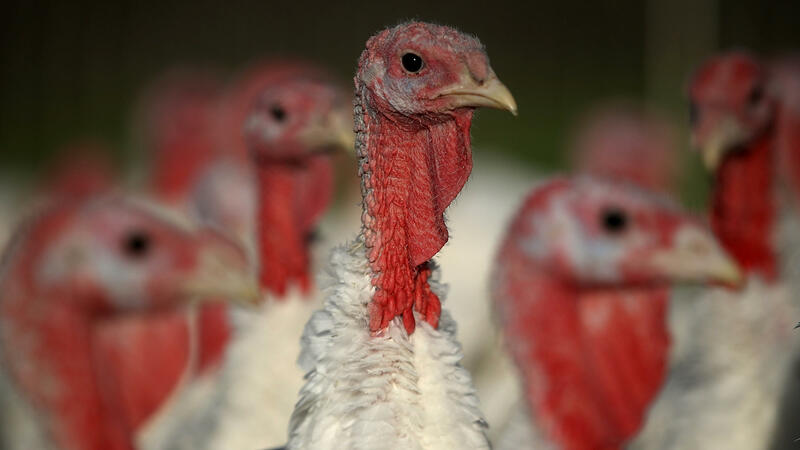 Alex Melton, an economist at the USDA, attributes that decades-long boom in part to Americans developing a taste for turkeys outside of Thanksgiving. The recent leveling off, he says, tracks closer to the trends economists typically see with other poultry. "That [growth] probably lines up with the expansion of lunch meats and things like that," he says. Melton also notes that lower-than-normal wholesale prices in the past year, as well as higher levels of turkey meat kept in cold storage, indicate a lower demand for turkey so far this year. Though the USDA hasn't made any conclusions as to why this might be, Melton suggested it could be in part because Americans are turning toward higher-fat meats. "With the recent move toward diets like 'Paleo,' and studies suggesting benefits to higher fat intake than previously recommended, consumers may be turning to more red meats and other protein sources," he says. Another reason for the long-term increase in turkey production is work in genetic enhancement, says Beth Breeding of the National Turkey Federation. This results in larger — and heavier — turkeys. But it's possible that changing Thanksgiving traditions will end up pushing the industry in the opposite direction. Bloomberg reported last week that smaller families are driving a trend toward tiny turkeys (though 12- to 14-pound turkeys remain the biggest seller) at Thanksgiving. "Whole birds are still by and large the most popular for Thanksgiving, but the industry is also recognizing that trends do change and some people are just cooking a breast or a smaller turkey for thanksgiving," Breeding says. And any changes to the way Americans celebrate — and eat — at the Thanksgiving table could have big effects on the turkey industry. Breeding says the Thanksgiving season accounts for nearly 20 percent of all turkeys eaten in the U.S. While no one region of the U.S. has a monopoly on turkey farms, four states accounted for about half of all turkeys raised in 2017: Minnesota, North Carolina, Arkansas and Indiana. Other top-producing states include Missouri, Virginia, Iowa and California.